One of the most frequently performed oral surgery procedures is the surgical removal of third molars. For years, however, general dentists and oral surgeons alike have debated the proper time and necessity for removal of impacted wisdom teeth. Now, a recently completed clinical study of more than 9,500 patients reveals that the optimum time for extraction is between the ages of 12 to 24 years. The study was published in the October 1985 issue of the journal of Oral and Maxillofacial Surgery and involved more than 16,000 impacted third molar extractions. It was conducted by Drs. Osborn, Frederickson, Small and Torgerson, four Detroit area oral and maxillofacial surgeons. For purposes of the study, the oral surgeons divided the patients into three age groups. The 6,455 patients in Group I (67.5 percent) ranged in age from 12 to 24 with a mean age of 19.6. The 1,942 patients in Group II (20.3 percent) had a mean age of 28.7 years with a range of 25-34 years. The remaining patients, totaling 1,177 (12.3 percent), ranged in age from 35-83. The mean age of Group III was 45.3 years. Males constituted 42.8 percent (4,097) of the study population while females made up 57.2 percent (5,477). 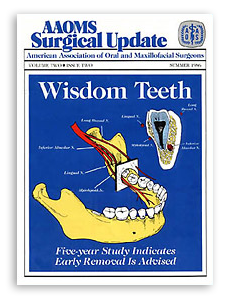 Non-function was the most common reason most patients had their wisdom teeth removed. Other reasons were: · pericoronal infections · pain · orthodontic requirements · caries · cyst or tumor formation Of the 16,127 mandibular third molar extractions, 16 percent (2,649) of the teeth were erupted while 84 percent (13,478) were impacted. According to the ADA classification of impacted third molars, 16.5 percent were soft tissue impactions; 72.6 percent were partial bony impactions and 10.9 percent were complete bony impactions. In mesioangular and horizontal impactions, as the crown of the wisdom tooth encroaches on the distal bone support of the second molar tooth, early removal helps preserve the periodontal integrity. Significant among the findings was paresthesia. This sequelae arising from the extraction of teeth was four times more prevalent among 25-34 olds than 12-24 year olds. Paresthesia occurred three times more often in 3583 year olds. It is easy to see from the illustration that even a minor variation in anatomical position, such as impaction of the third molar, can bring a nerve into the surgical field during routine removal. In total, the occurrence of nerve paresthesias was 6.5 times greater for patients older than age 24. Because of the completion of root formation, the root tips lie in closer proximity to the inferior alveolar nerve. This most likely accounts for the greater incidence of paresthesia in Groups II and III — 3.5 and 6.5 times respectively–seen with this type of surgery as opposed to surgery for the removal of erupted teeth. The study showed that 55.3 percent of the patients suffering from nerve paresthesia had normal sensation within two months and 78 percent experienced normal sensation within three months. Twelve percent of those with paresthesia still had nerve dysfunction six months after surgery. When queried regarding postoperative pain, 12 percent of the patients in Group II (25-34) reported they had experienced alveolar osteitis. This number is 1.6 times greater than that reported by patients in either of the other two age groups. It could be speculated that a greater number of difficult impacted teeth or problem teeth were removed in the group, resulting in the increased alveolar osteitis and incidences of paresthesia. Overall, the incidence of alveolar osteitis was five times greater following surgery for complete bony impactions than for erupted teeth; four times greater following surgery for partial bony impactions; and two times greater following removal of tissue impactions. In cases where pericoronitis was involved, there was twice the incidence of alveolar osteitis than in non-pericoronitis cases. In the presence of either cysts or tumors, alveolar osteitis occurred nearly three times more often than it did with erupted teeth. This seemingly indicates that an increased incidence of alveolar osteitis can be expected with increased tissue manipulation and bony surgery. Results of the study shows that as patients become older there exists an increased chance of surgical morbidity with reference to nerve paresthesias and alveolar osteitis. Also indicated –as patients age and teeth continue to develop and remain unerupted, the incidence of postoperative complications rise and become more significant and prolonged. The oral surgeons thus concluded that, if indicated, removal of third molars should be completed in the teenage years to decrease both operative and postoperative morbidity. Functional third molars should be retained and restored. Because this study indicated significantly fewer complications among younger age groups, one should evaluate patients for removal by the time skeletal growth is complete(16-18 years of age). A recent review of the literature shows that most paresthesias will resolve in one or two years if left alone.